is always hung by the Indians under the eaves at the right side of a house. Although occasionally redecorated, it is never washed. EFFECTS of drinking ayahuasca range from a pleasant intoxication with no hangover to violent reactions with sickening after - effects. Usually there are visual hallucinations in color. In excessive doses, the drug brings on nightmarish visions and a feeling of reckless abandon. Consciousness is usually not lost, nor is there impairment of the use of the limbs. In fact, dancing is a major part of the ayahuasca ceremony in some tribes. The intoxication ends with a deep sleep and dreams. An ayahuasca intoxication is difficult to describe. The effect of the active principles varies from person to person. In addition, preparation of the drink varies from one region to another, and various plant additives may also alter the effects. The Yuru, orb ceremony in the Colombian Amazon involves ritual ayahuasca intoxication. 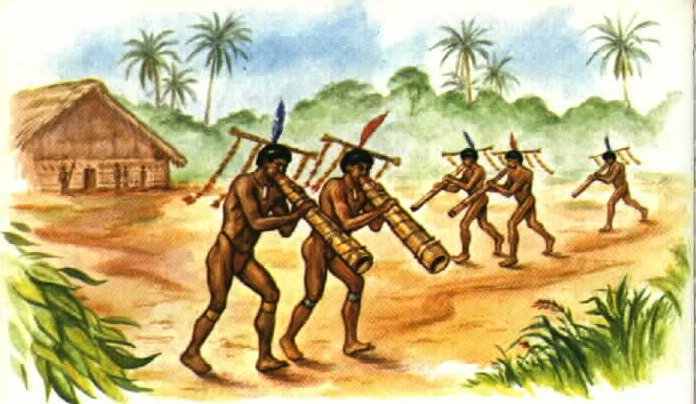 The Indians are blowing sacred bark flutes. CEREMONIAL USES of ayahuasca are of major importance in the lives of South American Indians. In eastern Peru, medicine men take the drug to diagnose and treat diseases. In Colombia and Brazil, the drug is employed in deeply religious ceremonies that are rooted in tribal mythology. In the famous Yurupari ceremony of the Tukanoan Indians of Amazonian Colombia - a ceremony that initiates adolescent boys into manhood - the drug is given to fortify those who must undergo the severely painful ordeal that forms a part of the rite. The intoxication of ayahuasca or caapi among these Indians is thought to represent a return to the origin of all things: the user "sees" tribal gods and the creation of the universe and of man and the animals. This experience convinces the Indians of the reality of their religious beliefs, because they have "seen" everything that underlies them. To them, everyday life is unreal, and what caapi brings them is the true reality. CHEMICAL STUDIES of the two ayahuasca vines have suffered from the botanical confusion surrounding them. However, it appears that both species owe their hallucinogenic activity primarily to harmine, the major ,B-carboline alkaloid in the plants. 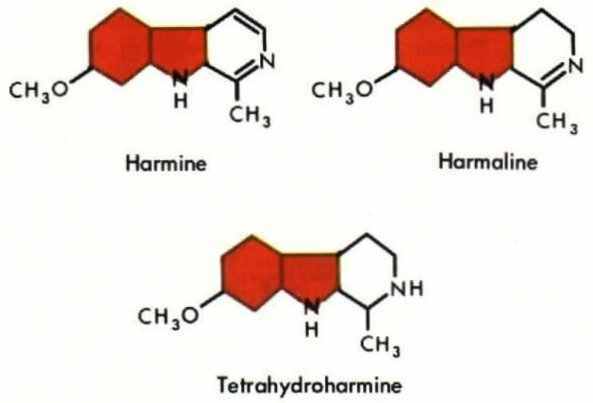 Harmaline and tetrohydroharmine, alkaloids present in minor amounts, may also contribute to the intoxication. Early chemical studies isolated these several alkaloids but did not recognize their identity. They were given names as "new" alkaloids. One of these names--telepathine--is an indication of the widespread belief that the drink prepared from these vines gave the Indian medicine men telepathic powers. Chemical formulas of Banisteriopis caapi and B.inebrians alkaloids. Indole nucleus is shown in red. 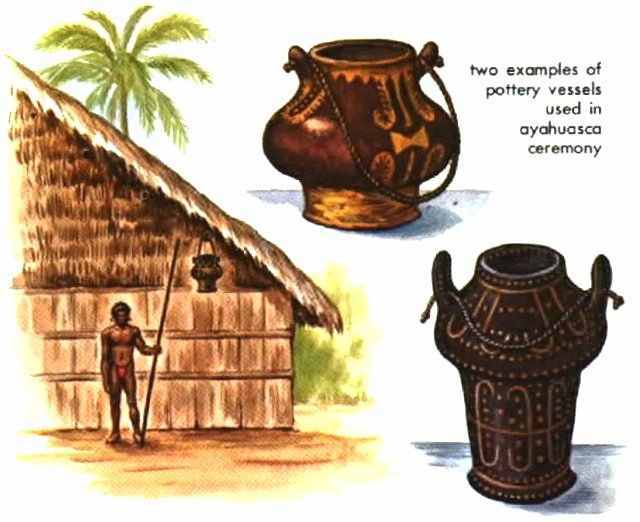 PLANTS ADDED TO AYAHUASCA by some Indians in the preparation of the hallucinogenic drink are amazingly diverse and include even ferns. Several are now known to be active themselves and to alter effectively the properties of the basic drink. Among these are Datura suaveolens (p. 145) and a species of Brunfelsia (p. 140)--both members of the nightshade family, Solanaceae, and both containing active principles. Two additives, employed over a wide area by many tribes, are especially significant. The leaves (but not the bark) of a third species of Banisteriopsis - B. rusbyana - are often added to the preparation "to lengthen and brighten the visions." Called oco-yajé in the westernmost Amazon region of Colombia and Ecuador, the liana is cultivated for this purpose, along with B. caapi and B. inebrians. 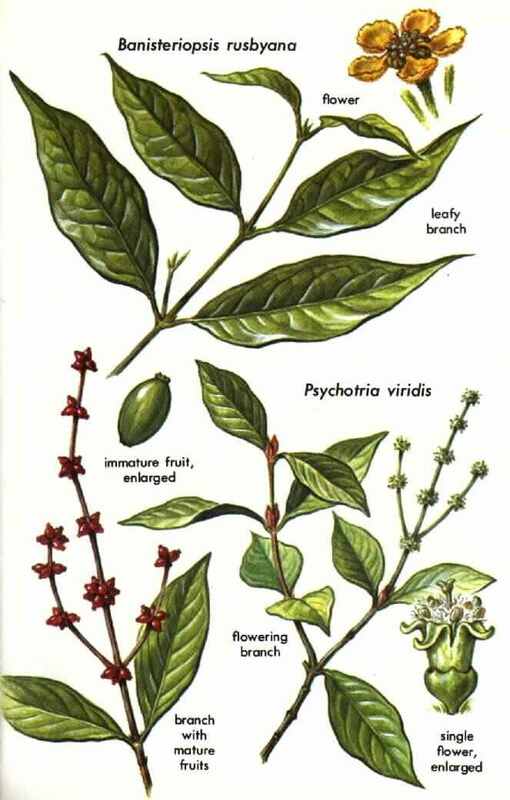 Over a much wider area, including Amazonian Brazil, Colombia, Ecuador, and Peru, the leaves of several species of Psychotria - especially P. viridis - are added. This 20-foot forest treelet belongs to the coffee family, Rubioceae. Like B. rusbyana, it has been found recently to contain the strongly hallucinogenic N. N-dimethyltryptamine. ANOTHER KIND OF CAAPI is prepared from Tetrapteris methistica, a forest vine also belonging to the family Malpighioceae. One group of Maku Indians of the northwesternmost part of the Brazilian Amazon prepares a cold-water drink from the bark. There is no other plant ingredient. The drink is very bitter and has an unusual yellow hue. This may be the " second kind" of caapi mentioned by several explorers as caapi-pinima, meaning "painted caapi." 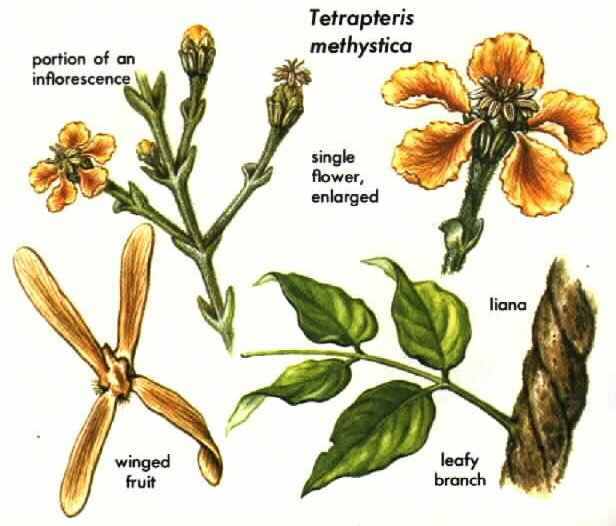 Although T. methystica produces effects identical with those of Banisteriopsis caapi, we still know nothing of its chemistry. However, it is closely related to Banisteriopsis and there is every probability that similar or identical alkaloids are present. There are 90 species of Tetrapteris - vines and small trees found throughout the humid American tropics. SHANSHI (Coriaria thymifolia) is a widespread Andean shrub long recognized as very poisonous to cattle. It has recently been reported as one of the plants used as an hallucinogen by peasants in Ecuador. Shanshi is their name for the plant. 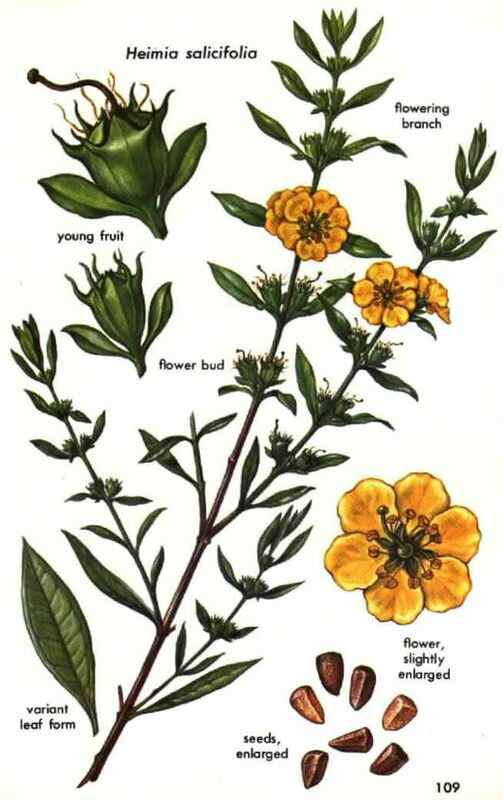 The fruits are eaten for their intoxicating effects, which include the sensation of flight. The weird effects are due possibly to an unidentified glycoside, but the chemistry of this species is still poorly understood. Shanshi is one of 15 species of Coriaria, most of which are shrubs. They are found in the mountains from Mexico to Chile, from the Mediterranean area eastward to Japan, and also in New Zealand. 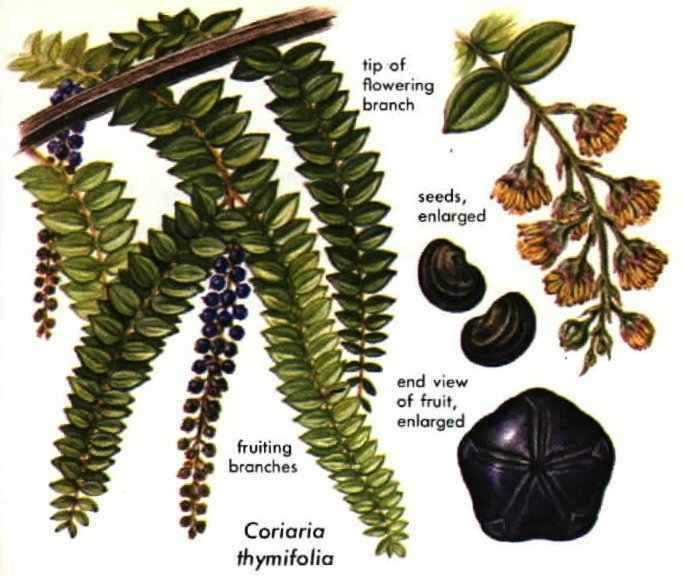 Corioria is the only known genus in the family, Corioriaceae. SINICUICHI (Heimia salicifolia) is a poorly understood but fascinating auditory hallucincogen of central Mexico. Its leaves, slightly wilted, are crushed and soaked in water. The resulting juice is put in the sun to ferment into a slightly intoxicating drink that causes giddiness, darkening of the surroundings, shrinkage of the world, and drowsiness or euphoria. Either deafness or auditory hallucinations may result, with voices or sounds distorted and seeming to come from a distance. Partakers claim that unpleasant after- effects are rare, but excessive drinking of the intoxicant can be quite harmful. 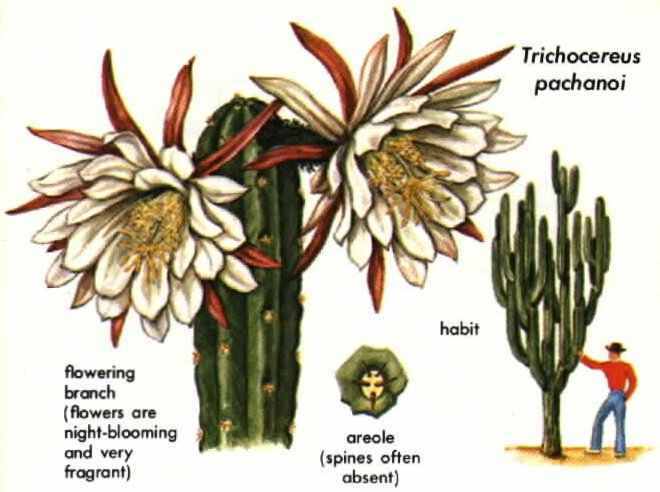 Sinicuichi is a name given also to other plants that are important both medically and as intoxicants in various parts of Mexico. Other intoxicating sinicuichis are Erythrina, Rhynchosia, and Piscidia, but Heimia salicifolia commands the greatest respect. With the closely related H. myrtifolia, it has interesting uses in folk medicine. Only in Mexico, however, is the hallucinogenic use important. SAN PEDRO (Trichocerous pachanoi) is a large columnar cactus widely cultivated as a hallucinogen in the Andes of Peru, Ecuador, and Bolivia. The natives, who also call it aguacolla, or giganton, recognize several "kinds," which differ mainly in the number of ribs, the most common type having seven. This cactus is sometimes planted along fields as a fence row to keep sheep and cattle from grazing. An intoxicating drink called cimora is made from the San pedro cactus. Short lengths of the stem, often sold in native markets, are sliced like loaves of bread and then boiled in water for several hours, sometimes with superstitious objects such as cemetary dust and powdered bones.